When your fireworks go boom, how do you know where they'll land? To answer this question, University of California Berkeley scientists model blast envelopes to improve firework safety and enjoyment. The ancient art of fireworks gets a supercomputer makeover. Simulation calculates 100 million grains against the forces of drag across time. Modeling will improve firework safety and enjoyment. Summertime is here, and the living is . . . easy? Well, you can rest a little easier knowing scientists are hard at work to make your 4th of July fireworks show safer. Just in time for the celebration, we revisit our expose on Tarek Zohdi's 'explosive' research. Though we’re mired in the throes of winter here in the US right now, it won’t be long before we’re looking skyward to Independence Day fireworks. To improve the bombastic experience, scientists took to supercomputers to concoct the perfect pyrotechnical recipe. Big bang theory. Industrial grade fireworks can contain 100 million grains. When modeling the effect of atmospheric drag across time, calculations can soar into the exabyte range and beyond. Courtesy Tarek Zohdi. Fireworks accompany all types of celebrations, from weddings to sporting events, to political rallies, and holidays. They achieve their expected effect when a launched packet of combustible particles detonates overhead. As the ensuing explosion forces these grains outward — unlike in the vacuum of space where they would travel forever outward — the drag in our atmosphere slows them. It’s this drag that creates the magic of fireworks. To improve on the ancient art, Tarek Zohdi, chair of the University of California at Berkeley Computational & Data Science & Engineering Program and professor of Mechanical Engineering, set out to understand how a firework blast envelope changes over time. In research recently published in the Proceedings of the Royal Society A, Zohdi simulated the motion of each grain as it interacted with the drag forces over time to see how long it takes for the blast to dissipate. Considering there are approximately 100 million grains in an industrial-grade firework, a full-scale simulation requires an equivalent number of differential equations. Zohdi’s simulation checks each particle’s interaction with every other particle at each of the approximately 106 time steps in a simulation requiring on the order of 1024 operations. When coupled with data storage needs, this simulation becomes a task requiring a supercomputing environment. That’s why Zohdi is tapping the world’s fastest supercomputers to manage his model. What he’s learned will improve firework aesthetics and make them safer. To optimize a firework’s wow factor, Zohdi says, you need to know how large the blast radius is going to be, how long it will take to explode after launch, and how long the blast will last in the air so that it can be observed and enjoyed. 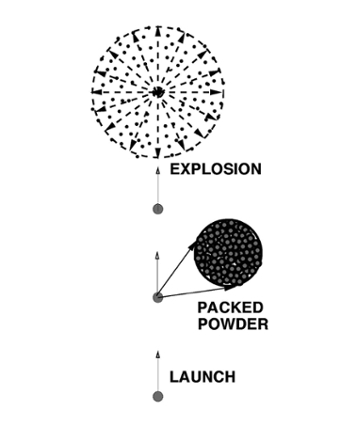 Making a better firework means also considering the color and texture of the firework. The color of the cloud seen is a function of the material mixed in the powders, so for blue, add cesium and copper. For red, try a little lithium. 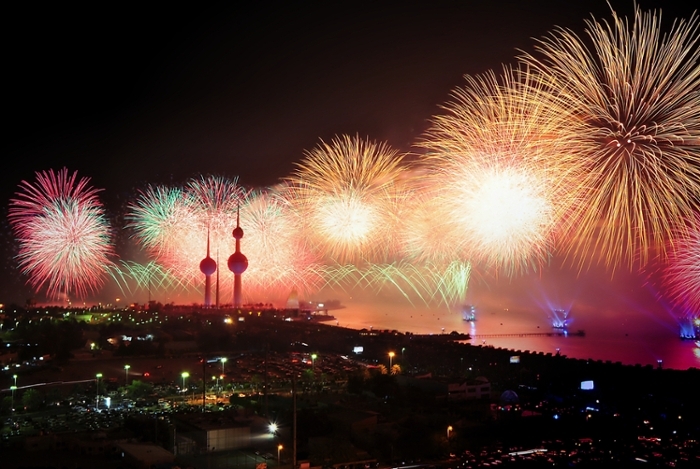 In addition to aesthetic enhancement, Zohdi’s simulation will also improve firework safety. Without knowing how large the firework blast radius is going to be, operators could cause a fire, since the residue might fall into tinder, which is why many states in the western US have outlawed fireworks. Falling particles also risk striking participants or bystanders who have gathered to see the fireworks. Anticipating the force of the blast also provides information needed to contain the fireworks in case they were to prematurely explode. Thanks to Zohdi’s simulation, we can look for a safer firework experience — and more oohs and ahhs for all concerned.